For 3 generations Aardvark Painting Inc has been providing Glencoe and the Chicago North Shore with top notch Professional painting contractor services for your Glencoe homes. When we arrive on the job our first responsibility as Professional Glencoe painters is to assure that all furnishings, carpeting, floors and all your valuable items are protected. Being Professional Glencoe painters the next step in a quality paint job is preparation. Being a full service painting contractor in Glencoe, we make all drywall repairs where needed also we sand all walls, ceilings and trim that is to be painted to insure proper adhesion so your paint job will last a long time. Aardvark Painting Inc is your one stop shop for all your Glencoe painting needs. Our professional and skilled painters in Glencoe can not only handle any painting request you may have for your Glencoe home or office, we also provide other related services to ensure your entire home is in top shape no other Painting Company in Glencoe can compare to our 100% customer satisfaction Guaranteed! Change the complete look of your room with a new color, invigorate your family room, living room or energize your bedroom with a fresh coat of paint. Aardvark Painting does all kinds of paint jobs from small homes, large restaurants commercial stores and we treat every job with the same attention to detail and quality. Hire us as your residential painting company in Glencoe. Our professionalism and experience will transform your next painting project into an original work of art. Nothing is worse than an old dilapidated exterior, the outside paint of a house can reflect the personality of the people living in it and nowadays, Glencoe house painting is one of the most affordable ways to improve the impression of ones home. However, it takes a lot of effort to do this job. One needs to clean the surface first, determine the type of paint to be used, and apply it. Always remember that a person should not paint a house when it is too hot because direct exposure to hot sun will dry the paint too fast causing damage to the paint job. The best time to paint is in late spring or early fall when the weather is neither too hot nor cold. Power washing the outside of your house is the first thing we do since it is the dirtiest and most exposed and if the surface is not cleaned this could lead to a bonding problem and cause your paint to peel, this process also removes loose paint. Stubborn dirt and stains will be treated with a bio-degradable cleaning solution then brushed, scrubbed and rinsed. After washing, now the house has a dirt-free foundation ready for the new coating. We always move any patio furniture, cover plants and any other items to protect them from paint drips and spills. Trees and bushes may get in the way too and it is best to cover it first with canvas drop cloths. Now we are ready for some painting, applying the primer to raw wood and metal surfaces. other areas in need after power washing. Applying a primer is a necessity in every Aardvark Painting house painting project because it gives a firm foundation for finishing paints and provides extra protection against elements like ultra violet rays, heat, strong winds, humid environment and rain. It produces a uniform surface that provides a sheen and appearance of the finish coat. Primers also increase the overall adhesion, quality and durability of the Glencoe paint job. 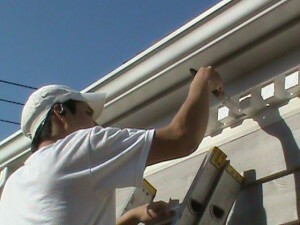 Primer grips the surface and helps the exterior of the house to last for many years to come. When working on new wood, priming is always needed. The final process is to apply 2 even coats of high quality exterior warranted paint that will last for years to to come. Aardvark Painting offers a lifetime warranty on some quality products that will be included in your free painting estimate in Glencoe. If you’re looking for a professional painting contractor in Glencoe, then please call us today at 224-585-8035 or complete our online painting estimate form.